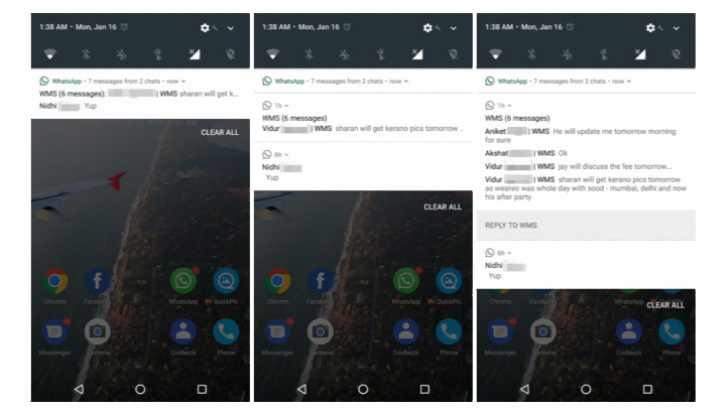 A new WhatsApp beta app is available, which now supports Google’s Android Nougat revamped notifications system. Previously, WhatsApp only shows the latest message of a conversation in its notifications. However, your message would disappear when you got a new one from the same conversation. With the latest update, WhatsApp beta has fixed the problem and notifications finally behave like they should in Nougat. Now, if you receive multiple messages from someone, they will all be shown in the notification. When you reply from the notification, your messages will be shown in it too. Additionally, multiple messages from multiple conversations will be bundled in one notification. However, you can unbundle them and reply to each conversation separately, all within the notification area. This functionality will be released to everyone later. If you want to try Whatsapp beta, go here.